Topics: Computer Room, Door Fan/room, Commercial Kitchen, Paint Booth, and Fire Extinguisher. accessfireprotection.c.. Paint Booth,spray booth,vehicle booth,auto booth fire suppression ..
accessfireprotection.c.. 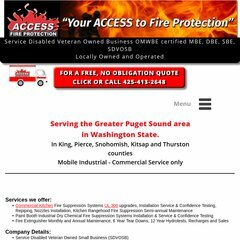 Kitchen fire,restaurant fire,fire suppression, UL300,rangehood ..
accessfireprotection.c.. Extinguisher,fire extinguisher,types of fires,class of fires,types ..
Godaddy.com Inc (Arizona, Scottsdale) is the location of the Apache server. There are 2 Nameservers, ns07.domaincontrol.com, and ns08.domaincontrol.com. Accessfireprotection.com's IP address is 208.109.14.75. PING (208.109.14.75) 56(84) bytes of data.